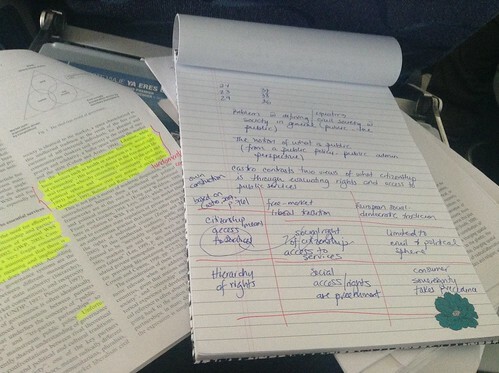 When I was in undergraduate (I studied chemical engineering), it was bizarre for my male colleagues that I would have such neat printing and that my notes were always drawn in different colors and clearly differentiated. For example, when I drew distillation towers, I would use purple for the distillate and pink for the vapor being generated. Same when I drew heat exchangers (I would draw the different components in various colors). My affinity for neat handwriting (printing) and writing by hand, and having great notes for later reading has remained through graduate school and now that I’m a professor. When I write, I use a technique that I learned in graduate school that seemed to mimic what I did when I was in undergraduate. I write and then use a set of miscellaneous series of memorandum (memoranda) for my research. So, when I read, I write a memorandum to myself summarizing the journal article, book chapter, and copying exact wording for key phrases that I believe are important to cite in future research. This way, I know EXACTLY what the author said and when he/she said it, and I can cite pages and authors. I did this for every single paper, book chapter, book and journal article I read for my comprehensive examinations and I continue doing so for my current post-PhD research. So, for example, say I’m summarizing a paper (in this case, I took one chapter in a book edited by Alex Loftus and Farhana Sultana on the human right to water by my friend Jeremy Schmidt as an example). I mark potential good quotes in the chapter (note that in the case of books, I don’t actually write on the margins, but I attach sticky notes) and then type them into a memorandum. 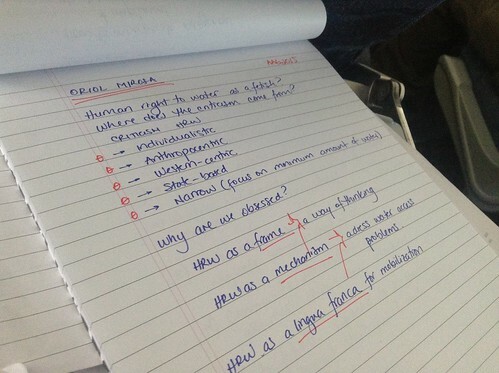 The keywords for said memorandum included “right to water”, “counterpoints”, “alternate views on human right to water”. Or for example, when I write notes from a talk or conference paper, I always try to make sure to capture the main points of the author/speaker in my notes, and write them in such a way that I can then easily transcribe them. For this particular example I used the recent AAG talk by my friend Oriol Mirosa also on the human right to water. All of these go into my Research folder, under whichever project I’m writing (I have different folders for each project and for each paper). My folder structure for papers is per year (e.g. My Papers 2015, and then the tentative title of the paper) I type my notes and memoranda into MS Word files and save them then I also upload them on to Evernote so that they can be easily searchable. While I primarily use Evernote to save news clippings for each project I’m doing, I also use it for my notes. I am extremely old school, and thus I print out my journal articles, book chapters, and I highlight them, and I also write notes by hand, and then type them. I find that I learn much more when I do this. It’s also good because I can go back to my handwritten notes when I need to cross-check a particular reference. So when I have a set of memoranda about a particular topic (e.g. 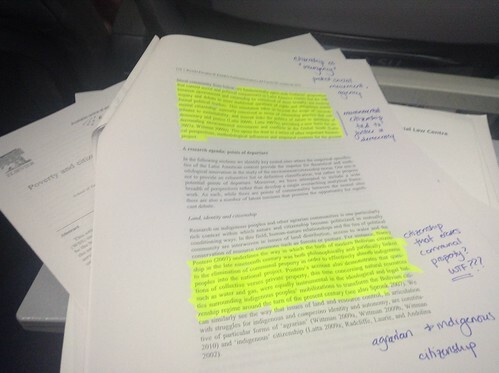 a paper on the human right to water, which is what I’m writing right now), I pull out my highlighted journal articles, I cross-reference them with the outline I’ve written by hand, and then I copy-and-paste quotations as I deem relevant. This helps me think through a full manuscript following the same style as I mentioned before, I fill up a paragraph on a particular theme, and then another, then another. Following this method rigorously is necessary for me if I want to maintain a certain level of productivity, measured by how much I read and how much I write. And as usual, I integrate this process with my morning writing ritual. I want to clarify that my memoranda aren’t just typed notes with specific quotations. 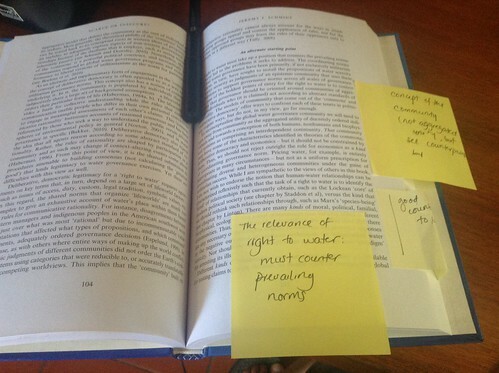 They’re also self-reflective notes where I argue, agree or counter-argue with the author’s point. This is an important distinction from simply typed notes (which are still helpful), because self-reflection is what makes my writing and my research move forward. For fieldwork, I usually do a similar thing where I type my handwritten notes and my voice notes, but I figured I should write separately about how I write these field notes (for a future post!). 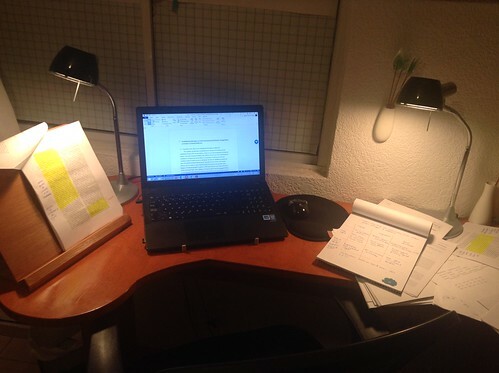 Tagged with academic writing, AcWri, MyAcWriStrategies, research.